Dr. Dave (left) and Ruth Bare of Nine Mile Falls estimate they've grown and donated more than 6,000 pounds of fresh produce. Dr. David Bare works in the secular realm, yet you get the sense upon meeting him that he and his wife, Ruth, feel a calling towards helping others. Their good deeds are done by the ton, every one a nutritious, sustaining mouthful. For several years, the couple has donated the majority of their garden's bounty to address local food insecurities. "We harvested about three-and-a-half tons of vegetables last year, and we already have harvested two tons so far this year," says Dr. Bare, who figures that weekly harvesting through early fall totals around 105 hours each year. "Five people, including Ruth, help pick, and they are doing this, on average, at least three times a week." The process starts in March from seedlings Bare tends to in the basement until the couple can get them planted in their nearly 17,000-square-foot garden. A new cold frame extends the season about two weeks on either end, says Bare, who plants beans, berries, squash, root vegetables, tomatoes — 17 varieties — and more, totaling around 180 different plant types. The Bares have been growing a garden at home since the couple were first married and Bare was in medical school in Seattle. He realized early on that getting people to eat healthy was a challenge, and advised his family practice patients: "If it grows on a plant, eat it; it it's manufactured in a plant, don't eat it." Currently, Bare works full time as an urgent care physician for CHAS Health in Spokane, as well as several days a month as a medical director for the Medically Managed Treatment via Suboxone or Subutex (combating opioid addiction) program at Spokane's Riverside Recovery Center. 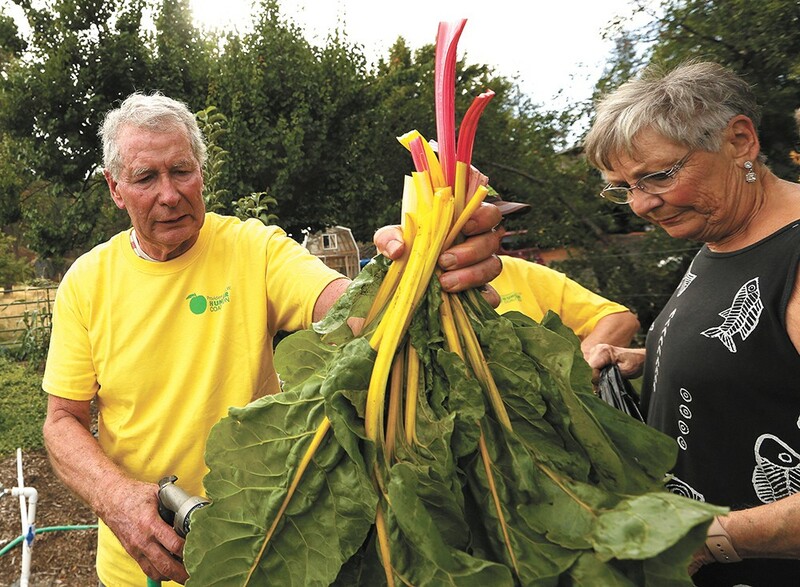 The couple keep some of what they grow, sharing with their adult children's families nearby, but donate the rest: more than 6,000 pounds since moving onto their Nine Mile Falls acreage four years ago. Picture a zucchini or pumpkin the size of a Volkswagen bus, times three. In the beginning, Ruth was hauling the produce to Second Harvest in Spokane. Then the Bares met Donna Russell, an associate with AmeriCorps VISTA who was working with Rotary First Harvest's Harvest Against Hunger program connecting gleaners to area farmers. Russell had heard about the Bares three years earlier from a friend who attended the same church as the couple. They agreed to let Russell pick up and deliver produce to 13 of the 15 food pantries in Stevens and Pend Oreille counties served by the nonprofit Providence Northeast Washington Hunger Coalition, with a service area stretching from Colville to Kettle Falls to Wellpinit and other small, rural towns in between. Dr. Dave Bare, delivering some much-needed nutrition to the rural poor. Poverty, hunger, poor life choices and inadequate access to healthy food are common denominators in several regional needs assessments of rural Northeast Washington — and all factors that helped prompt the forming of the Northeast Washington (N.E.W.) Hunger Coalition in 2011. "The majority of the food pantries had never seen such a magnificent harvest of fresh vegetables," says Russell. 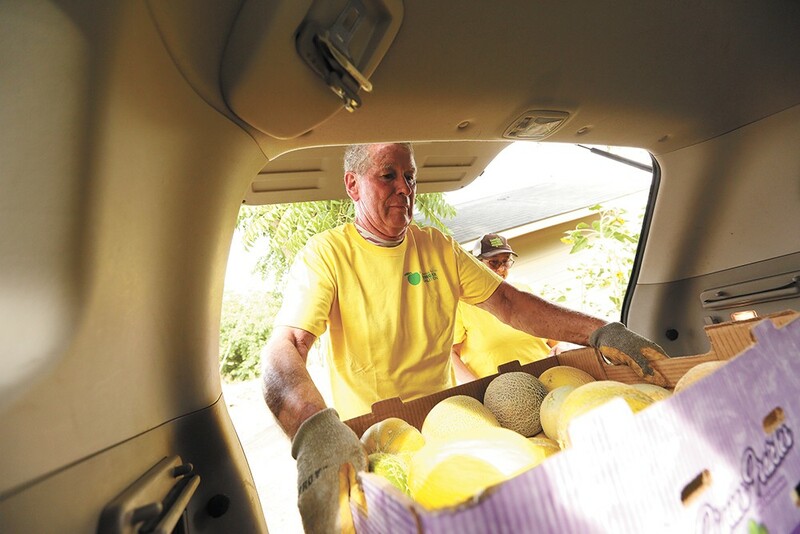 "Normally the produce they get is tired and old, having been on store shelves for a few days, before being donated and then warehoused before being trucked out." In addition, says Russell, some of the food pantries deliver to homebound seniors, who are thrilled with fresh produce. "Living in a rural area, we aren't always able to have programs like Meals on Wheels available, and the food pantries have stepped up to fill that gap," she says. Russell's passion for addressing food insecurities is personal. In 2012, when her husband lost his job of 34 years with Wonder Bread, they relied on her part-time, $10-an-hour job, but had to tap the food bank to get by. "I have always felt an obligation to give back and not be a taker," says Russell, who initially volunteered with the Food Pantry in the Stevens County community of Tumtum. When her husband resumed employment, Russell was able to devote more time to the coalition, including their annual fundraising gala. Word is getting around about the coalition's programs, says Russell, who has found people eager to help. "I have had various types of produce just hanging from my mailbox, donated by neighbors, and my newspaper delivery person," she notes. Russell got an early boost from a few other coalition volunteers, including Nils Johnson of Washington State University's Stevens County Extension office, who helped build a refrigerated trailer Russell now tows behind her vehicle. Johnson also helped the Bares adjust their planting plan, advising them on which foods had the most nutritional value and that people most often requested. Working in medicine, says Dr. Bare, can take a lot out of you. "I'm an introvert, and so [working in the garden is] a real part of energizing each day," he says.